Kitten training prevents bad behavior and rewards good behavior. A cat can learn almost every trick, as long as the owner treats it with love and care, and uses the right approach. Cats may be domesticated, but still they rely heavily on their instinct. You can see that with pregnant cats. Kittens are not different. They simply learn many basic habits by copying their mom, without the cat owner’s help. But that doesn’t mean problems won’t occur. A little kitten training can prevent a lot of trouble. KITTEN TRAINING IS BEST STARTED AS SOON AS POSSIBLE. Begin once you feel a kitten starts to trust you. To come on command is one of the first things you might want to teach your kitten. It is not difficult. Call your kitten at mealtime, every day. Repeat it when the food is presented. Also repeat the name consistently while playing with your kitten. In some way, even playing is a form of kitten training. Of course, a simple name of one syllable is easier remembered by your cat. But nothing is impossible. Well, almost nothing…. CATS ARE QUICK LEARNERS. THAT IS: IF THE OWNER DOES IT WELL. If your kitten doesn’t seem to know what a litter box is for, you can help. Put the kitten in the tray, hold the front paws and show how to scratch. Most cats quickly understand what you mean. Kittens are easier to train than adult cats. But if the relationship with the owner is good, adult cats may learn just as well. They may only need more time. PUNISHMENT WON’T WORK WITH CATS. REWARD DOES. Physical punishment leads to mistrust. Cats don’t want to be beaten – who does, actually? Nevertheless, there are situations in which you will want to punish. Do it in such a way that the cat will not blame the owner. 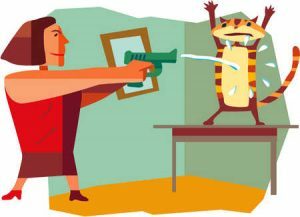 The water pistol is a clear favorite among cat owners. It is a perfect instrument to use for kitten training. However don’t confuse a cats dislike of being sprayed with water as a dislike of water in general. Though cats may often refrain from drinking water, it is very important and necessary for them to do so. They are picky drinkers and perhaps you can offer a water fountain as a reward too. We recommend the Miaustore fountain. IF YOUR CAT EATS FROM A PLANT, SPRAY YOUR CAT WITH A LITTLE WATER FROM A WATER PISTOL. Do it without saying a word, and without attracting any attention. The cat will then associate eating from plants with an unpleasant water spray, not with the one who operates the water pistol. Never reward bad behavior. Otherwise your cat will think it was OK. If your cat uses your furniture to sharpen its nails or simply to have fun, buying a cat scratching post is highly recommended. Do not declaw kittens. Declawing might save your sofa, but it is cruel, unnatural and unnecessary. It is the opposite of kitten training. Just like scratching, urine spraying is normal feline behavior. It is caused by male hormones. You can reduce spraying by neutering your tom cat. And again, by using the water pistol. In some cases cat repellant may be effective too. At least it keeps your cat away from locations you want to keep odour and urine free. Kitten training can be used for various purposes. You can train a cat to sit, lie down, jump and even play the piano – yes, Walt Disney’s Aristocats were more realistic than you ever thought. If you want your kitty to jump on the table or play a melody from, let’s say, Andrew Lloyd Webber, you will have to use the same principle. 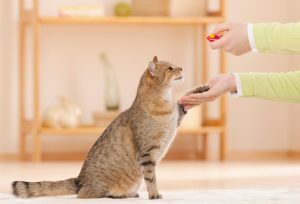 Use a command (a new one for every trick) and give your cat a reward – a snack works best. And do this over and over again. It may take twenty times before your cat knows the trick well. CLICKER TRAINING IS AN ALTERNATIVE WAY OF TRAINING YOUR CAT. Karen Pryor is an American clicker trainer with an excellent reputation. “In clicker training you watch for the behavior you like, mark the instant it happens with a click, and pay off with a treat. The treat may be food, a pat, praise, or anything else the learner enjoys. If the learner makes a mistake all you do is wait and let them try again”, she explains on her web site. Clicker trainers focus on building behavior, not stopping behavior. Cats quickly learn that the marker signal means that something good is coming. 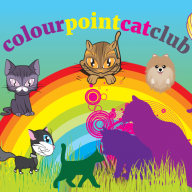 With clicker training you can teach your cat to come when called, play without biting or scratching, stay off the table, walk on a leash, do cute tricks and games, all with a click and a treat. It’s a very interesting method of kitten training. Every cat owner can do it. Clicker training has been successful with many cats. We like cats because they are independent and social, affectionate and wild, child and predator, and all this at the same time. Previous Previous post: Cute Kitten Names Are Easily Found – But Does Your Cat Listen? Next Next post: Are You Good Cat Parents?